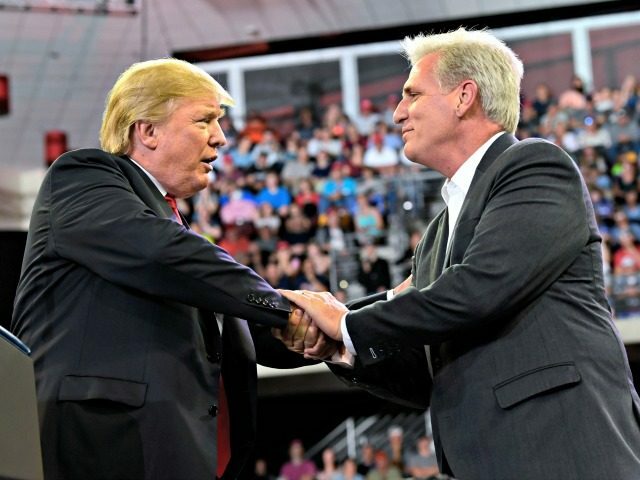 House Majority Leader Kevin McCarthy will introduce a bill this week that will fully fund President Donald Trump’s planned wall along the U.S. border with Mexico, thereby setting the midterm elections up as a referendum on immigration policy, Breitbart News has learned exclusively. Outgoing Speaker Paul Ryan hinted at a post-election border wall funding fight on Monday. “We intend on having a full-fledged discussion on how to complete our mission to secure the border, and yes, we will have a fight about this,” Ryan said of the wall fight that looms at a news conference on Monday. Now Breitbart News can exclusively report exactly what is expected to happen in the lead-up to, and immediate aftermath of, the midterm election. First, McCarthy, his office confirmed to Breitbart News, will introduce a bill this week that includes the full funding for the border wall–about $23.4 billion more than what has already gone to the wall effort–as well as several other enforcement measures that have already passed the House of Representatives. Congress has already directed $1.6 billion to wall funding in the omnibus spending bill for fiscal year 2018 that just passed Congress, and McCarthy’s new bill–titled the “Build the Wall, Enforce the Law Act”–would take the wall the rest of the way, in addition to providing for a variety of enforcement measures. The enforcement measures expected to be in this wall funding legislation include, among other legislation, Kate’s Law, an enforcement bill named for Kate Steinle, who was killed in sanctuary city San Francisco in the lead-up to the 2016 presidential election. Kate’s Law passed the House 257-167 last year. Also included will be a bill the House has already passed targeting sanctuary cities, the No Sanctuary for Criminals Act, which passed the House last year 228-195. The Criminal Alien Gang Member Removal Act, which passed the House last year 233-175, will be in the bill, as will two House resolutions on immigration that passed the House this year: one upholding and honoring Immigration and Customs Enforcement (ICE) officers, the other admonishing illegal alien voting in a number of American cities. McCarthy’s forthcoming bill will not deal with Deferred Action for Childhood Arrivals (DACA), the illegal executive amnesty program that former President Barack Obama implemented granting temporary status administratively to illegal alien youths, or visa programs. In other words, the bill will be enforcement and security only, dealing with those other more contentious immigration policy matters in future legislation after the wall funding is secured and enforcement of immigration law is strengthened. McCarthy’s bill introduction comes as he travels Wednesday to the U.S. border with Mexico, where the wall will be built, to meet with Border Patrol agents. While on the border, McCarthy will receive an operations and threat briefing from Border Patrol and law enforcement officials, speaking directly with the men and women who on a daily basis on behalf of the United States confront illegal immigration, drug smuggling, human trafficking, and weapons trafficking. Given that this new bill comes from the Majority Leader, McCarthy, and this bill contains several other measures already passed by the House with high margins of success, its prospects for passage are promising. 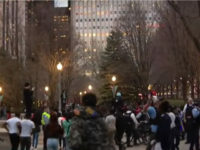 In the Senate, however, a measure like this faces grimmer prospects as Republicans cling to a 51-49 majority but would need 60 votes to clear a filibuster hurdle on a cloture vote unless Senate Majority Leader Mitch McConnell changed Senate rules–something he has resisted doing amid enormous pressure. But that’s where things get interesting, as Republicans could pick up as many as five or more extra Senate seats in the midterm elections depending on how a variety of races shake out–meaning they would be much closer to that 60-vote threshold making it easier to roll the necessary Democrats and get the votes required to clear the cloture hurdle of 60 votes and get a bill like this to the president’s desk so he can sign it. But Republicans’ Senate reinforcements will not arrive until January 2019 when the new Congress is sworn in, so that means whatever the House passes in late 2018 for it to become law unless the Senate goes for it this year would need to be passed again in early 2019. All of that, of course, sets up an incentive for Republicans to show up to vote on November 6: a vote for a Republican is a vote for the wall, in other words, as the House GOP will need to hold its majority going into the next Congress to ensure that this border wall funding makes it to the president’s desk. If Democrats take the House on November 6, a newly reminted Speaker Nancy Pelosi most certainly would not support funding the wall along the border–which, in turn, makes the midterms a referendum on the wall because if Republicans hold the House and add seats in the Senate, they can get the votes necessary to get full wall funding to Trump’s desk in early 2019.